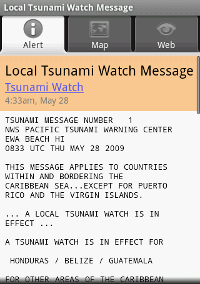 Tsunami Alert is an Android application that will alert you when a potentially dangerous tsunami has occurred. With real-time data from NOAA's Tsunami Warning Centers, get alerts for the United States, Canada, and all countries along the Pacific Ocean, Indian Ocean, and Caribbean Sea. When a Tsunami Warning is sent, your phone will ring and vibrate until you view the alert. Tsunami Alert will show you the alert with details of the area effected, what to do, a map of where the earthquake occurred, and other information to help you respond. How will I be notified when a tsunami alert is sent? Tsunami alerts are automatically updated every 5 minutes, so you will be notified within minutes of when a tsunami occurs. You will be notified in different ways depending on the severity of the tsunami alert. When a tsunami warning, the most severe alert, is issued you will be notified in the status bar and the notification ringtone and vibration will play continuously until you view the alert. For tsunami watches and advisories you will be notified in the status bar and the notification ringtone and vibration will play just once. 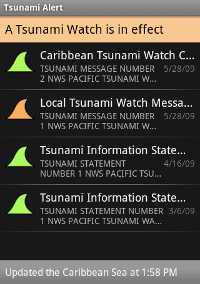 For a tsunami information statement you will be notified in the status bar, but no ringtone or vibration will play. Note: If you disable automatic updates or alert notifications in the settings, you will not be notified regardless of the severity of the tsunami alert. There are 5 different regions for tsunami alerts. You can choose your region via the settings menu. Covers the US states (except Hawaii), Canada, Puerto Rico, and the Virgin Islands. Covers all countries in the Pacific basin except the United States and Canada. Covers all countries around the Indian Ocean. Covers all countries around the Caribbean Sea. For more information, see NOAA's Tsunami Warning Centers areas of responsibilities. Are all alerts the same? There are 4 different types of tsunami alerts. They are listed below in order of declining severity. The highest level of tsunami alert. Warnings are issued due to the imminent threat of a tsunami from a large undersea earthquake or following confirmation that a potentially destructive tsunami is underway. They may initially be based only on seismic information as a means of providing the earliest possible alert. Warnings advise that appropriate actions be taken in response to the tsunami threat. Such actions could include the evacuation of low-lying coastal areas and the movement of boats and ships out of harbors to deep water. Warnings are updated at least hourly or as conditions warrant to continue, expand, restrict, or end the warning. The second highest level of tsunami alert. Watches are issued based on seismic information without confirmation that a destructive tsunami is underway. It is issued as a means of providing an advance alert to areas that could be impacted by destructive tsunami waves. Watches are updated at least hourly to continue them, expand their coverage, upgrade them to a Warning, or end the alert. A Watch for a particular area may be included in the text of the message that disseminates a Warning for another area. The third highest level of tsunami alert. Advisories are issued to coastal populations within areas not currently in either warning or watch status when a tsunami warning has been issued for another region of the same ocean. An Advisory indicates that an area is either outside the current warning and watch regions or that the tsunami poses no danger to that area. Advisories are updated at least hourly or as conditions warrant, the Advisory will either be continued, upgraded to a watch or warning, or ended. Information Statements are issued to inform that an earthquake has occurred and to advise regarding its potential to generate a tsunami. In most cases, an Information Statement indicates there is no threat of a destructive tsunami, and are used to prevent unnecessary evacuations as the earthquake may have been felt in coastal areas. An Information Statement may, in appropriate situations, caution about the possibility of a destructive local tsunami. A supplemental Information Statement may be issued if important additional information is received such as a sea level reading showing a tsunami signal. An Information Statement may also be upgraded to a watch or warning if appropriate. If you receive a a Tsunami Warning for your local area you must take immediate action. Move inland to higher ground and stay there. 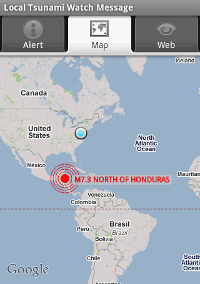 Initial alerts are sent within minutes of an earthquake occurring. As more information becomes available, additional alerts will be sent. If you have any questions, problems, or suggestions, please contact us at support@paltasoftware.com.